Fashion Trends: They’re Always Changing! By simply taking a quick glance around you, it’s plain to see that things are always changing. In fact, there is perhaps no better time than that of the holiday season and the new year, to take note of some of the newly emerging fashion, trends and technology as shopping centers everywhere begin plastering their walls and shelves with all the latest gadgets, accessories and apparel, in the hopes of appeasing the continuous flow of holiday shoppers. In keeping up with the ever changing world of fashion and commerce, one learns to appreciate those few things in life that are timeless and simply never go out of style, one of which would certainly be a beautiful smile. A beautiful and seemingly flawless smile has long been a necessity in the world of both Hollywood and the fashion industry, and although certain styles may come and go, no fashion model or movie star’s look is complete without the ever-present, pearly white smile! As result of this, public demand for a beautiful smile has remained a top priority for dentists past and present and thanks to amazing innovations in cosmetic dentistry such as porcelain veneers, (which have proven themselves as one of the premier tools within a modern dentist’s arsenal) the achievement of that coveted beautiful smile has never been easier! Originally popularized in the 1980s, porcelain veneers have been used in dental restorations for a good number of years now, and have been considered by a large number of dentists to be one of the most effective ways to create a seeming flawless smile for their patients. Porcelain Veneers, also called dental veneers, are a thin shell-like device designed to be fitted directly over your teeth. The purpose of this is to provide a protective coating to surround your teeth; protecting them from outside elements, while simultaneously covering up any unsightly aberrations or abrasions in your teeth. By providing a solution that is practical and aesthetically pleasing, dental veneers have become a highly popular and sought-after procedure within the realm of cosmetic dentistry, and continue to remain so! Porcelain Veneers: Six Reasons to Get Them! The reasons for getting porcelain veneers generally depend on the specific wants and needs of the patient, and certainly no patient is exactly alike. Listed below are some of the more common reasons that patients elect to receive porcelain veneers. Do some of them apply to you? Accidents happen, and perhaps one of the most common reasons you may require porcelain or dental veneers, is that you have through some sort of accident or mishap, and have either chipped, cracked or simply broken a tooth. This can happen to absolutely anyone for all sorts of different reasons, and while there is certainly no way to anticipate the severity of the damage, the porcelain veneer can usually be customized to match the other teeth regardless of the damage. Related Article: Got a Chipped Tooth? We’ve Got Options for You! While actors such as Steve Buscemi and Gary Busey have made something of a living from their famously odd or crooked teeth, for the majority of people a misshapen smile may present something of an issue in various aspects of life. To remedy this issue, many patients opt for dental or porcelain veneers that can be custom-made to evenly match color, size, and shape of their other teeth. It’s not uncommon for people to find themselves unhappy with the color of their teeth, and while there are other (more commonly used) methods such as having your teeth cleaned and whitened, porcelain or dental veneers can be used to achieve a whiter smile as well. Typically whitening options are suggested prior to implementing porcelain veneers. Unfortunately, if the staining is severe enough, standard cleaning and whitening may not be all that effective. 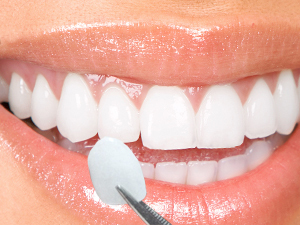 Being the only product capable of providing a truly white smile, porcelain veneers may be used to provide the white smile that the patient desires. It should come as little surprise, that as a person ages, their teeth endure a certain amount of wear and tear over the years. This leads them to become increasingly brittle and less effective. However, porcelain veneers have proven to be a great way to combat this ongoing problem. By encasing the teeth, they provide protection and added strength while chewing food. While not usually serious, having gaps between your teeth can certainly be something of a pain, particularly when eating foods that are sticky or can easily become caught between your teeth. Even though Lauren Hutton and Madonna have famous smiles with gaps in their teeth, a lot of people don’t like those gaps for aesthetic reasons. Dental veneers can be a solution to both of these problems. By covering the teeth, they can simultaneously cover and fill any troublesome gaps that you might have for functional or aesthetic reasons. There are few things in life more enjoyable than smiling. At Overland Park Dentistry, we believe that everyone deserves to smile and be happy without the persistent fear of embarrassment when they smile. Remember life is too short not to smile, so consider letting porcelain veneers help keep you happy and smiling! A Beautiful Smile Is Always In Style! As we prepare for the bombardment of “what’s new” or the “latest” in whatever, we might find ourselves taking the time to appreciate something without all the bells and whistles. As mentioned earlier, a beautiful smile has long been a required feature the fashion and entertainment industry, and not just because it’s beautiful. If any chips, stains or other issues are keeping you from smiling, then perhaps porcelain veneers are the answer for you. Come see Dr. Charles Kimes at Overland Park Dentistry and his expert team, so we can keep you happy and smiling! Dr. Charles R. Kimes, DDS and his expert team at Overland Park Dentistry look forward to having the opportunity to care for you and your family with any preventative, restorative or cosmetic needs you or your family may have. To schedule your dental appointment and see if you are a candidate for porcelain veneers, contact us at our south Overland Park office at (913) 647-8700 or our north Overland Park office at (913) 341-2380.